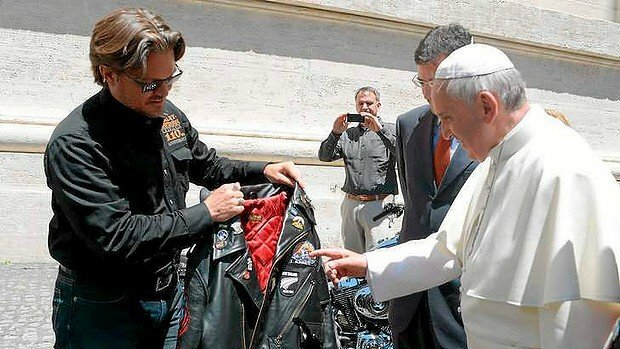 Pope Francis blessed crowds of motorcyclists at the Vatican for the 110th anniversary of Harley-Davidson. Leather-clad bikers lifted their arms to greet the pontiff as he was driven up the avenue leading to St Peter’s Square to celebrate mass and give his Sunday angelus. Some had “Papa Francesco” (Pope Francis) flags fixed to their bikes, which were parked all the way down the Via della Conciliazione among the trinket shops and snack stands. Emmanuele Jaconi, an Italian biker, said he saw nothing strange in the juxtaposition. “Just because we’re motorcyclists doesn’t mean we’re not Catholics,” he said. Rome was invaded by thousands of motorcyclists for the four-day celebration, during which Pope Francis – in something of a marketing coup for the Wisconsin-based manufacturer – was given two white Harley-Davidsons for the Vatican police force, as well as a black leather vest with an eagle on the back.